WOW! Prime Exclusive Deal - *BEST SELLER* Toshiba 50-inch 4K Ultra HD Smart LED TV with HDR - Fire TV Edition $289.99 (Retail $399.99). 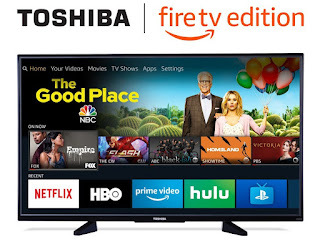 •Toshiba 4K UHD Smart TV – Fire TV Edition delivers true-to-life 4K Ultra HD picture quality with over 8 million pixels for stunning clarity, deep contrast, and vivid colors. •With the Fire TV experience built-in, enjoy tens of thousands of channels, apps, and Alexa skills, including Netflix, Prime Video, Hulu, HBO, SHOWTIME, STARZ, and more. •Fire TV Edition seamlessly integrates live over-the-air TV and streaming channels on a unified home screen (HD antenna required). •Easily control your TV with the included Voice Remote with Alexa—plus, launch apps, search for TV shows, play music, switch inputs, control smart home devices, and more, using just your voice. •Dimensions (W x H x D): TV without stand: 44.6" x 26.4" x 3.7", TV with stand: 44.6" x 27.8" x 10.7". Multiple device input/output options: 3 HDMI including 1 with ARC, USB, composite input, digital output (optical), antenna/cable output, audio output, Ethernet.